Happy New Year! 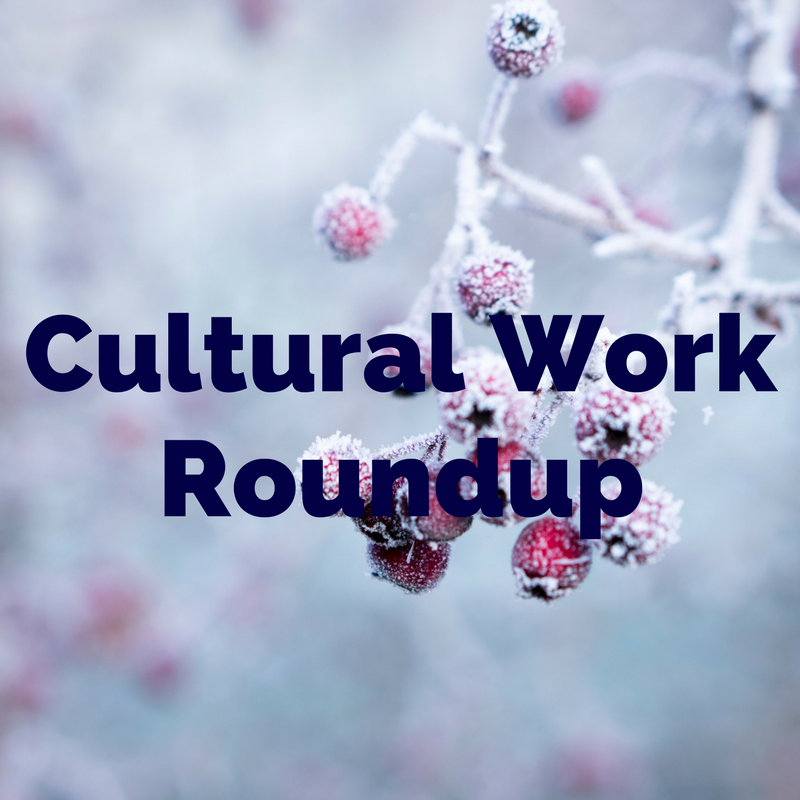 Kick off 2018 by checking out these opportunities to celebrate the creativity of artists and cultural workers of color. Tuesday, 1/2: Ignite Your Personal Story From Within – Lynne Duddy and Lawrence Howard teach people intentional storytelling, where the process all starts with learning how to tell stories improvisationally by being resourceful and using the power of spontaneity. Their approach focuses on trusting the story and speaking extemporaneously from the heart. This lecture explores the possibility of creating your story orally before writing it down. 6:30pm-8:30pm, The Old Church Concert Hall. Thursday, 1/4: Only the Oaks Remain – “Only the Oaks Remain” tells the true stories of those targeted as dangerous enemy aliens and imprisoned in the Tuna Canyon Detention Station, located in the Tujunga neighborhood of Los Angeles, by the US Department of Justice during World War II. Rare artifacts such as photographs, letters, and diaries bring the experiences of prisoners—who included Japanese, German, and Italian immigrants and extradited Japanese Peruvians—to life. 3pm-6pm, Oregon Nikkei Legacy Center. Every Monday, 1/8 – 1/29: Hip Hop + Spoken Word: Find Your Activist Voice – Together, we’ll take a critical look at society and find our voices through creative writing, an examination of history and hip hop culture, and dialogue. In this class, we’ll learn from veteran anti-fascist organizer Mic Crenshaw, who will open our eyes to what has been useful in the past, what can be effective now, and what mistakes we need to avoid in our activism. In honest discussions, we’ll explore the intersections between capitalism, the prison-industrial complex, the military-industrial complex, entertainment, and dominant culture. 6pm, 2420 NE Sandy Blvd. Saturday, 1/13: Bao Pham & Yuka Sakuma Exhibition – The exhibit will feature work from Bao Pham and Yuka Sakuma, an artist from Nagoya, Japan. The event is open to all ages, and the artists’ work focuses on contemplation and renewal. 5pm-8pm, Nucleus Portland. Monday, 1/15: Racing to Change: Oregon’s Civil Rights Years – Racing to Change illuminates the Civil Rights Movement in Oregon in the 1960s and 70s, a time of cultural and social upheaval, conflict, and change. The exhibit examines how racist attitudes, policies of exclusion, and the destruction of Black-owned neighborhoods shaped Oregon, as well as the unceasing efforts of the Black community to overcome these obstacles. The exhibit will run from January until June. 10am, Oregon Historical Society. Friday, 1/19 – Sunday, 1/21: Staged Reading of The Brothers Paranormal – Theatre Diaspora presents a workshop staged reading of The Brothers Paranormal. Two Thai-American brothers launch a ghost-hunting business in order to capitalize on the nationwide increase in sightings of Asian-looking ghosts. When the siblings end up investigating the home of an African American couple who claim to be haunted by one very terrifying spirit, everyone’s notions of reality, fantasy, and sanity clash against the shocking truth. At its heart this play is an modern allegory about grief, loss and healing for communities of color, Times can be found on Facebook page. Lincoln Hall. Saturday, 1/20: NXT LVL X She Shreds J20 RALLY + PARTY – Hosted by Brown Girl Rise, this event will feature a rally with music, workshops, raffles, and much more. After the rally, a party will be held which features WOC bands and DJs; proceeds will go toward Queer Rock Camp Portland and the Portland Menstrual Society. 12pm-12am, 15 NE Hancock Street. Monday, 1/22: New Poetic Activism (Five-week Delve Readers Seminar) – This five-week reading seminar led by Shayla Lawson focuses on the first collections of two young poets working at the forefront of creating a new ‘American lyric’: Thief of the Interior by Phillip B. Williams and Of Being Dispersed by Simone White. There will be five workshops held during January and February. 6:30pm-8:30pm, 925 SW Washington St.
Wednesday, 1/24: Think & Drink with Scot Nakagawa and Jess Campbell – Join us for a conversation about the challenges and opportunities in community organizing around Oregon with Jess Campbell, co-director of the Rural Organizing Project, and writer and activist Scot Nakagawa. This event is part of our 2017–18 Think & Drink series on race, power, and justice, featuring onstage conversations exploring how community organizations, corporations, and religious groups work to change the structures and policies that govern our society. 6:30pm-8pm, The Alberta Rose Theatre. Sunday, 1/28: Tender Table Dinner: A Fundraiser for UNA Gallery – Tender Table is hosting a dinner to raise funds for UNA Gallery, a contemporary art space that highlights POC/Queer/Femme voices, projects, and work. Please join us for a variety of appetizers, mains, and desserts (all vegetarian) made with love by the amazing Tender Table network. Tickets are $25 – $50 on a sliding scale. 6pm-8pm, People’s Food Co-op. Racial Equity Learning Collaborative: The Racial Equity Learning Collaborative is a two-day, application-centered workshop designed for those connected to the public and social sectors who want to continue on their racial equity journey and reclaim their power to enact change. Drawing upon popular education, Theater of the Oppressed, and critical race theory models, we will collectively create a container for deeper learning. Workshops will run from 1/11 – 1/12. Apply to the Grant High School Screenprinting / Digital Media Artist in Residency Program: Grant High School is piloting an Artist in Residence series to grow meaningful connections between students and local artist/community members. Students will select 1-2 artists/designers per quarter to be a class Artist in Residence. The artist would get studio time and access to tools in exchange for a workshop, short lecture, and or critique. If the artist would like to, they can conduct a 1-8 day project with students in class. $350 stipend. Applications due 1/30/18.